Start Video easy and import your videos and photos from your camera, smartphone, analog source or computer. The import wizard makes this process quick and easy. Add amazing effects, text, your own commentary and background music to your videos. The program optimizes sound and image automatically. Access a whole range of output options – for instance, burn your projects to disc with animated menus to enjoy on your TV or publish them online. The optimized program interface with intuitive operation lets you create spectacular results in a flash. It also features a completely new design in bright, cheerful colors. Video easy supports import and export of the 4K Ultra HD video format. Experience crystal clear videos in up to 4 times higher resolution. Experience smooth previews without any delay during playback of high-resolution material, thanks to "Smart Preview" technical innovation. Create beautiful transitions between different scenes. Simply select from 20 new effect transitions, which make use of a completely new blur-based technology. When filming, you're often confronted with difficult lighting conditions – for instance, when directly facing the sun. Video easy lets you darken areas which are too bright or make shadowed areas brighter. 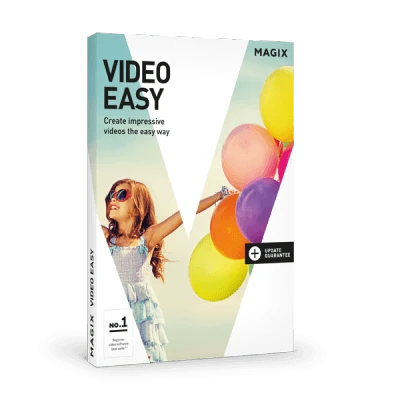 MAGIX Video easy enables you to upload your movies directly to social networks and video portals. Export your videos and movies to video players and storage devices quickly and easily using the Export wizard in MAGIX Video easy. This way you can access your films anytime, anywhere. Export your videos to MAGIX Music Maker MX (MX version or higher) and easily create fantastic songs and sounds for your videos.